I had taken an overnight train from Dunhuang to Lanzhou (pronounced "lun joe" as in run) arriving early morning. I had a ticket on the train to Lhasa (2188 km) which was stopping in Lanzhou around midday to pick up passengers. 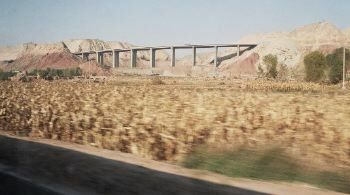 I was to travel on the train on the first afternoon climbing slowly towards the Tibetan Plateau, sleeping through the night and then spending all of the next day crossing the High Plateau arriving in Lhasa around 6.00 p.m.
On the left is the first iron bridge built in China across the Yellow River at Lanzhou. 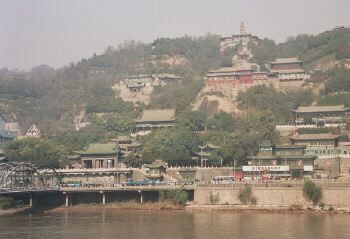 Lanzhou is an ancient city originally being a stop on the Silk Road. It's 1600 m above sea level in a narrow river valley on the lower slopes of the Qilian Shan range. It is the first city on the mighty Yellow River which flows out of the Tibetan Plateau. Lanzhou is the capital of Gansu Province with a population of 3.2 million. It's an industrial city and a major transport hub. Because of its valley confines the city consists of an urban corridor extending 20 km along the southern bank of the Yellow River. Lanzhou has the reputation of the most polluted city in the world being located in a curved valley which impedes free movement of air. From 400 to 1100 AD it was a place of Buddhist study along with other centres in surrounding Gansu. Recent archaeological excavations of neolithic painted pottery at a site 300 km south east of Lanzhou have been dated to 10,000 years ago. 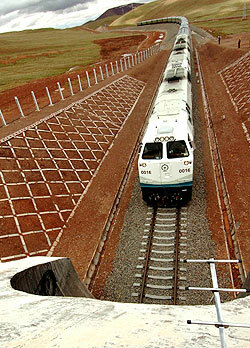 Because of the topograghy of the Tibetan Plateau all trains travelling to Tibet must pass through Lanzhou. The trains must follow a route which will allow them to approach from the plains of China and climb in manageable stages up the steep slopes of the northern face of the Tibetan Plateau to an elevation of over 5000 m. As such Lanzhou is the only way to go and thus is China's Gateway to Tibet. As well as Lanzhou, you can also board a train at Xi'an. The location of these departure points are shown on the attached map. The Tibetan Plateau is an immense block lying between India and China. Many readers would be familar with the towering wall of the Himalayas which rises from the plains of India. There is a similar mountain barrier on the Chinese side, but not as sheer, being made up by the Qilian Shan, Altun Shan and the Kunlun Shan ranges (shan, pronounced "sharn" means mountain or mountain range). The Tibetan High Plain is a vast elliptical plate elevated high above the surrounding countries of Pakistan, India, Bangladesh, China, Afghanistan and Tajikistan. At the wide north-south point, on a line through Lhasa, it is about 1250 km across and extends about 2200 km in an east-west direction. From Lanzhou the train travels westwards (passing through Xining) along rising country between the Qilian Shan range and the Tibetan Plateau to the city of Golmud (altitude 2800 m) perched on the slopes of the High Plain. 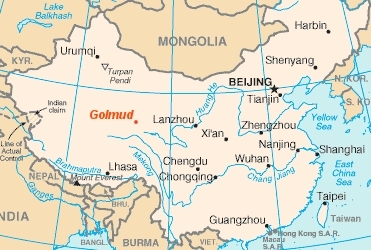 Golmud is in the Chinese province of Qinghai (pronounced "ching hi") which borders on Tibet. The new railroad to Lhasa is an extension of the previously existing railway to Golmud. The 846 km long Xining-Golmud line was completed in 1984 and has been upgraded in readiness for the new Qinghai-Tibet Railway. I must admit I didn't understand the route from Lanzhou to Golmud when I was travelling it. 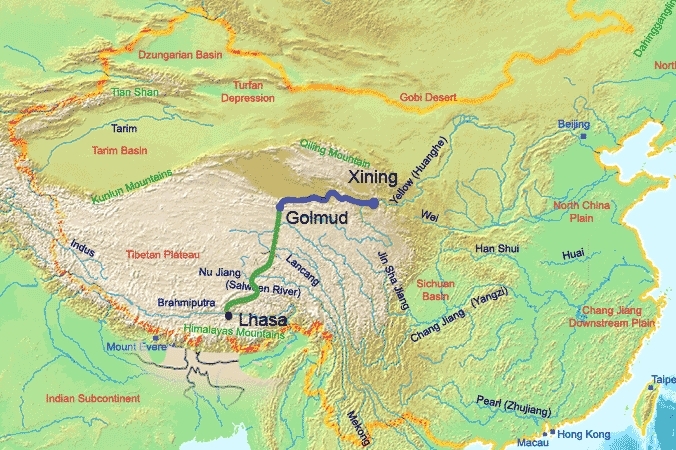 The route from Lanzhou to Golmud and the terrain it follows can be seen on the attached relief map. From Golmud the train turns south and follows a more, or less, straight path to Lhasa. A train on its way to Lhasa. Our trip was in early November which is at the end of Autumn and the tourist season in Tibet. I was very pleased to find our soft-seat compartment (with 4 beds) had no other occupants. Moreover the whole carriage was empty apart from one other compartment. I would be free to move around the carriage and from side to side to view things of interest and take photos. On the way out of Lanzhou, an example of the vast construction process going on in China. This modern bridge effortlessly spans the wide gap between two hills. The hills on each side of the bridge show interesting stratification and colourings in the hillsides. In the foreground is a crop of maize. 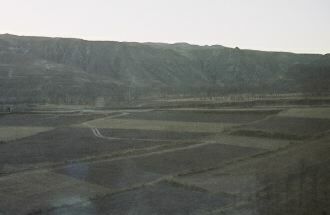 A valley floor on the way out of Lanzhou. Throughout the first afternoon the train climbed steadily winding its way slowly through picturesque countryside. The slope was gradual without the need of "switch backs". As darkness approached I made my way to the dining car. It turned out I was their only customer! That is except for a group of young train workers who saw the empty dining car as the place for a party. Young men sat down at the dining tables with slabs of beer and they were joined by excited young women. They weren't at all concerned that there was a western diner who could have reported their irregular behaviour to the authorities (I didn't). At the entrance of the dining car there was a board with coloured photographs of available dishes from which I ordered a meal. The food was fine, but the boisterous train crew could have been done without.